Once you’ve established that you indeed want or need to file an Alabama DBA, download the trade name registration form from the Alabama Secretary of State website. The form is the same whether you’re registering a trademark, service mark, or trade name, so don’t let that throw you off. If you still need to check that your desired trade name is available, do a business entity name search first. If your name isn’t taken by any existing entity in Alabama, go ahead and proceed to the next step. Otherwise, you’ll need to meet with a professional to discuss options for modifying your trade name. As we mentioned earlier, you’ll also need to include three specimens that show your trade name in use. The form defines specimens as samples which perform the function of verifying usage of a mark. These can be original versions or copies of your business’ flyers, advertisements, business cards, brochures or any other legitimate piece of physical evidence that you’ve been operating under the name you’re applying for. Alabama’s trade name registration filing fee is $30.00, so make sure to include a check for that amount made payable to the Alabama Secretary of State with your application. The bottom section of the registration form is designated for a notary public. The Alabama Secretary of State does not provide notary services, so you’ll be responsible for finding one on your own. 123notary.com is a great resource for finding notaries in your area. Reach out to a few, and when you find one that seems reliable, book an appointment to authorize the document. Do not sign it ahead of time. There are a couple of things you need to know before moving forward with your Alabama DBA. 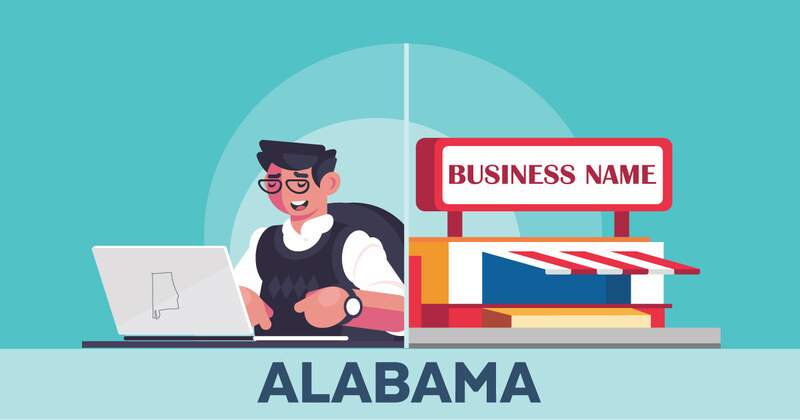 If you read through their DBA registration form, you’ll find that Alabama doesn’t require any business to register a trade name in order to legally do business under that name. In fact, you’ll need to submit evidence that you’ve already been using your trade name along with your DBA application. Sounds kind of backwards, right? Essentially, Alabama handles DBAs the same as trademarks. Instead of applying to use your trade name, you’ll be applying to own it, and thus prevent any other company from operating under your name. If you choose to use a DBA filing service instead of filing independently, you’ll have most of this legwork done for you. However, since Alabama is a little funky in the DBA department, not all providers offer services for Alabama businesses. Luckily LegalZoom, our #1 choice for DBA filing services, does. Feel free to visit LegalZoom or check out our other favorite DBA filing services if you feel like you could use a little assistance!